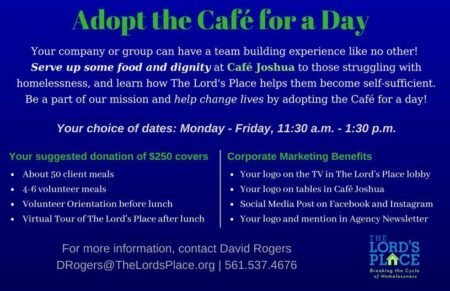 The Lord’s Place staff is thrilled to have volunteers to support our programs. Volunteers play an integral part in providing our clients with esteem-building, respectful services. A key service area is Joshua Thrift Store, 7600 S. Dixie Highway, West Palm Beach. We need volunteers to fill shifts at Joshua Thrift Store Monday through Friday 10 a.m. to 2 p.m. and 2 p.m. to 6 p.m. and on Saturdays 10 a.m. to 2 p.m. and 1 p.m. to 5 p.m. This opportunity is generally for adults. However, individuals 16 and 17 years old can volunteer at Joshua Thrift Store if accompanied by an adult. To volunteer with us we ask that you fill out this application and then attend one of our monthly volunteer orientations. After this point we will be able to match you with a program that best matches your interests and skill sets! 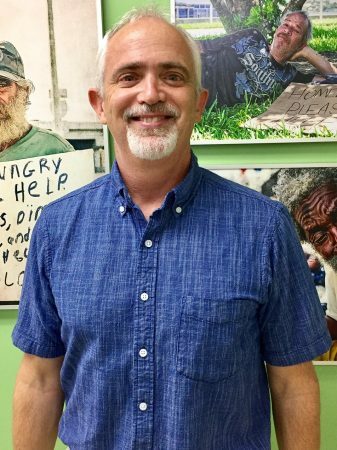 Volunteer orientations are held at 9 a.m. on the first Wednesday of the month and at 1 p.m. on the third Wednesday of the month at our administrative office, 2808 N. Australian Ave, West Palm Beach.